Adrian and Natalia, martyrs. Place of birth unknown, died at Nicomedia circa 304. Adrian was an imperial officer who converted to Christianity and was subsequently jailed. His young wife, Natalia, was barred from visiting once Adrian’s death sentence was handed down but she disguised herself as a boy and bribed the guards and somehow got in. When his sentence was carried out, Adrian was dismembered, and Natalia had to be restrained from climbing onto the funeral pyre on which his and other martyrs’ bodies burned. Then it started to rain. Onlookers gathered the wet bones and buried them at Argyropolis. Natalia snatched up one of her husband’s hands and moved to a house near his burial site. Agatha, martyr. Third century. Agatha, a young woman from a rich family, was being sexually harassed by a family friend. She rejected his advances, he got pissed, and sold her out to Sicilian authorities. Agatha was offered the chance to reconsider her positions on men and life but refused, at which point her torturers cut off her breasts, which is why she’s often depicted carrying her breasts on a platter. Andrew Fournet, priest. Born near Poitiers in 1752, died at La Puye in 1834. Andrew was generally listless until his uncle encouraged him to become a priest. He continued his ministry in secret after the French Revolution and was first arrested in 1792. He insisted on walking to jail rather than take a carriage because he felt walking was more appropriate. Once he eluded police by shoving aside a corpse on a bier and taking its place. Antony of Egypt, hermit. Born near Memphis circa 251, died on Mount Kolzim in 356. When Antony was 20 years old he decided he basically wanted to be alone. He opted for homelessness, working odd jobs here amid a regimen of mediation, study, and fending off beasts and demons. But he attracted a few followers and so in 312 left for a remote cave on Mount Kolzim, where he subsisted by weaving mats and baskets from palm leaves. Occasionally he’d bake enough bread to last him before disappearing into a darkened cell for six months. For a while he took up residence in an old fort and accepted food and water through a tiny crevice, speaking only a few words, and died at the age of 105. Benedict Joseph Labre, mendicant. Born near Boulogne in 1748, died in Rome in 1783. Between the ages of 18 and 22, Benedict made numerous attempts to join a religious order but was rejected for being mentally unstable. So he bummed around Western Europe in rags for three years. From 1774 on he slept in the ruins of the Colosseum at night and spent his days in churches. Bernadette, visionary. Born at Lourdes in 1844, died at Nevers in 1879. Marie was the malnourished eldest child of a poor man, deemed sweet but a little slow. At the age of 14, she experienced a series of wonders in a cave next to the river Gave. Other witnesses to these wonders did not see the Virgin Mary as Bernadette claimed to have done. She was admitted to the Sisters of Charity at Nevers at age 22 even though many of the sisters thought she was a phony and was even faking her asthma. “I am getting on with my job,” she’d tell them. “Which is what?” they’d ask. “Being ill.” She died at age 35. Gemma Galgani, laywoman. Born at Camigliano in 1878, died at Lucca, 1903. From 1899 on the stigmata appeared on Gemma’s hands every Thursday evening and would there remain until Friday night or Saturday morning. Eventually her confessor, Father Germano, told her to ask God to make it stop. She was generally quiet, her neighbors said, but also, possibly, a little crazy. Lutgardis, mystic. Born at Tongeren in 1182, died at Aywieres in 1246. Lutgardis’s family fobbed her off on a Benedictine nunnery when she was still a girl. In her mid-twenties she decided that she needed a more austere existence and so joined a group of Cistercian nuns near Brussels. There she levitated and dripped blood from her forehead and hair. She insisted on speaking Dutch even though Aywieres was a French-speaking community. Marina Abramovic, performance artist. Born in Belgrade in 1946. In her mid-twenties Marina experimented with jabbing her hands with knives, leaping through fires, and taking incapacitating psychotropic drugs. She tossed her hair and nail clippings into open flames. She and her boyfriend traveled through Europe, screaming, and routinely passed out in public. For a time she perched naked on a bicycle seat situated high on a wall, her arms outstretched in a manner reminiscent of crucifixion. In 1997 she spent four days singing songs and cleaning bloody cow bones in a basement in Venice. 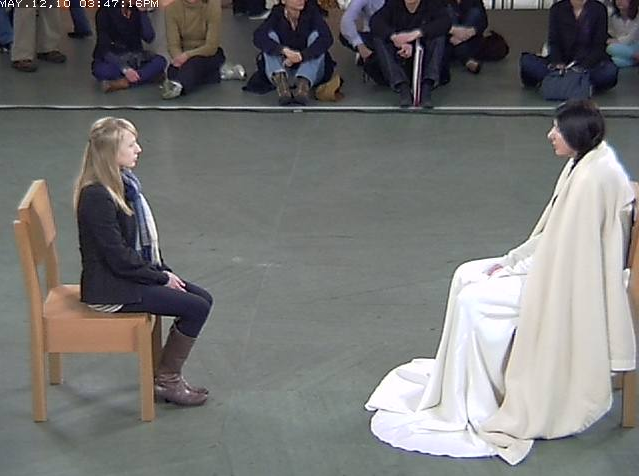 In 2010 she sat mute and immobile in a New York museum, inviting strangers to sit across from her, for 716 hours and 30 minutes. It was said people cried from staring at her. Martin de Porres, Dominican laybrother. Born in Lima in 1579, died there in 1639. As a young man Martin obtained a position cutting hair, doling out cash to the poor, and looking after the sick at a Dominican friary. He liked animals, including vermin, and started a hospital for cats and dogs at his sister’s house. He whipped himself three times before bed each night, and could heal people with a cup of water. He never left Lima, where he also gained a reputation as a reliable dispenser of relationship and fundraising advice, but people nonetheless reported seeing him in Algeria, China, and Japan. Thanks to The Penguin Dictionary of Saints. Copyright (c) Donald Attwater, 1965. Copyright (c) Catherine Rachel John, 1983, 1995. Megan Hustad is a writer based in New York.